Comparing those results to the Fox poll released immediately before the debate, we can, as objectively as possible, declare a winner: Ben Carson, who saw a five-point jump in the polls — a 71 percent increase over where he was two weeks ago. That confirms the impression of a post-debate Iowa poll from CNN/ORC, in which Carson leap-frogged longtime Iowa leader Scott Walker to place second behind the universal leader that no one expects to be a leader when the Caucuses occur, Donald Trump. Carson said he hopes his rising poll numbers will allow him more opportunities to talk about tax and foreign policy issues, rather than solely answer questions about race and health care. 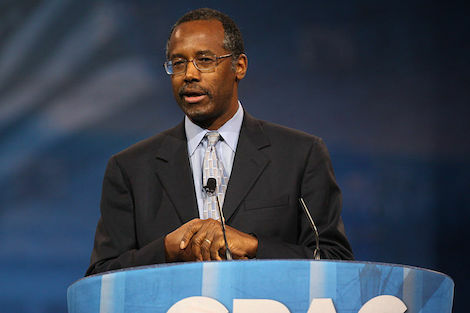 Republican presidential candidate Ben Carson says he believes some of President Barack Obama’s actions are anti-semitic. The more people really listen to Ben Carson–not just to his anodyne stuff about unity and common sense, but to what he means by terms like “political correctness”–the more they are going to realize the man is channeling Glenn Beck. Less attentive viewers of last week’s debate may have not quite realized that Carson was suggesting that eschewing the torture of prisoners was “politically correct.” He basically seems to think everything from an interest in anti-discrimination laws to observance of Supreme Court precedents to every sort of norm of international behavior is “politically correct,” and thus not only wrong, but somehow an illegitimate intimidation of righteous conservatives who represent the American people, whether said people know it or not. So the more Dr. Carson speaks out, the more the kind of Tea Partyish Republicans who seem attracted to him may realized Donald Trump is a more responsible and electable alternative.